We were hungry and tired after walking around all day working. We were in SM Makati, and a bit lost where to go because we were just really tired then. We decided to sit at a tea pace and order some drinks. Right beside it was a bakehop called Kumori. They have different stuff going on. Pudding, cheeseake (the Japanese version), different rolls, some chocolate dipped bread sticks. But one of the supposed best seller is the Krone. 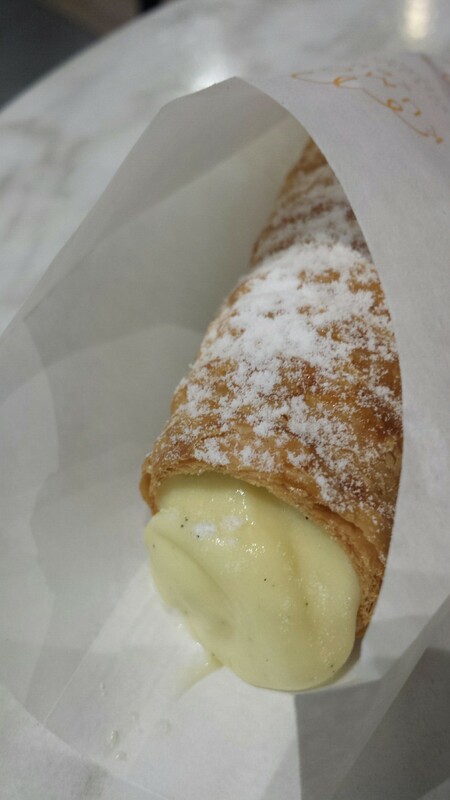 It looks like a canoli actually. But based on description, instead of the cheese filled pastry, it is filled with some egg custard. Both are finished by a sprinkling of powdered sugar. It is! 🙂 i want to try the other stuff soon! I wish I can find some stuffs like that here in Saga City. Where is that? I really think a cannoli comes close! 🙂 now i want to make one! Saga City is in Kyushu, a small city near Fukuoka. Yea, I think you should try to make one. Oh cool. Not familiar with the area but a new place is always interesting 🙂 i will try it soon! Thank you. That’s right…Anyway, good luck. I can’t wait to see your next blog.